Last time we opened a bit of discussion about raccoon damage to your commercial roof. 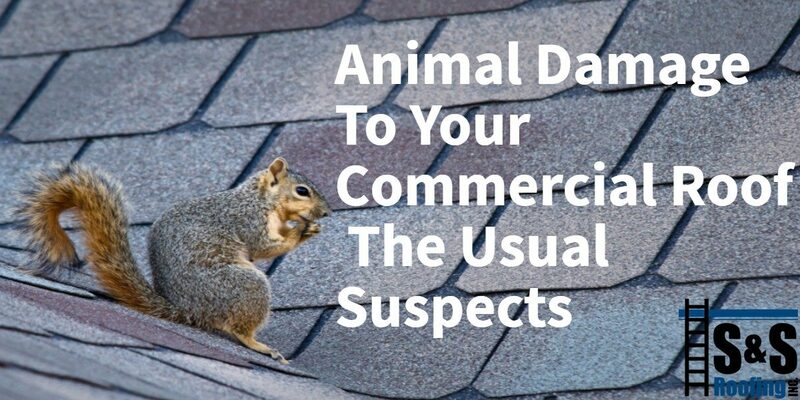 This got us to thinking, what other critters are guilty of chewing their way into a commercial roof? At S&S Roofing, we have pretty much seen it all in our more than 30 years serving New Jersey and the surrounding areas. The potential for commercial roof damage that involves various creatures is well documented and occurs all the time. If you suspect any roof damage, animal caused or otherwise, it is a good idea to contact the experts at S&S Roofing for a comprehensive inspection. The beloved rat, that symbol of squalor, but in reality they are really intelligent animals and they know how to get into a building through the roof. Just like their raccoon dumpster diving cousins, they gnaw their way through weak spots and end up creating a big hassle for the building owner. Rats love to chew on wiring and once they find a nice cozy roof to sleep in, they tend to start a family. And not a small family either, as rats can have up to 12 babies every three weeks. Big families like that tend to create lots of drama and soon enough your space will be overrun with rats. The consummate attic interloper the squirrel is one of the most versatile animals around. They only need a warm place to sleep, especially in the winter. That place, many times, is a warm toasty attic or commercial building somewhere. Just like rats, squirrels like to chew on things and they are especially fond of wiring as well. The last thing you want is to have the lights go out and find a squirrel barbecued in the ceiling. Yeah, bees can create damage to your roof as well, who would have thought? Bees can prove to be difficult to notice before it is too late. They can get in through tiny holes and from there create issues. The problem with bees is not the fact that they damage anything on purpose, they are just looking for a place to live. Their homes (or hives) are the problem. Once a honey bee hive is established it will continue to expand and once that happens it can damage the structure itself. The humble pigeon is responsible for more roof damage here in New Jersey than most people realize. It is not that birds are up on your roof pecking holes into your building, at least not your normal birds anyway. The danger that birds pose to your commercial roof is bird droppings. That’s right, bird poop will eat your roof over time. You see, bird poop is extremely acidic and will actually degrade your roof over time. Of course there always is the mighty woodpecker that, oddly enough, actually does drill its way through your roof. There are many ways to keep unwanted animals off of your roof but one of the most effective is removing any path that the animals can use to access the roof. This means that any trees, or overhanging vegetation should be removed. If the problem is really severe a professional exterminator should be consulted because once an animal issue is determined, it can be difficult to get rid of. Unfortunately, these creatures are extremely persistent when they are used to breaking into a building to stay warm. The best plan of action is to have your roof resealed. When you have a serious critter problem we will inspect and repair the damaged areas as needed. The most critical aspect of the repair is resealing the roof. In which we would recommend our liquid applied roofing system. This liquid roofing material is made of mesh membranes and liquid coating that generally provides a water tight seal that is exceptional for keeping out any unwanted animals. The best part of liquid applied roofing is that it may be applied over an existing roof. Of course all of the necessary repairs must be made before it is applied. So if you have had animal damage in the past or currently suspect damage from critters, contact S&S Roofing today.